Father Burns Children Stomach with hot knife for stealing fish, Gets Himself Arrested. 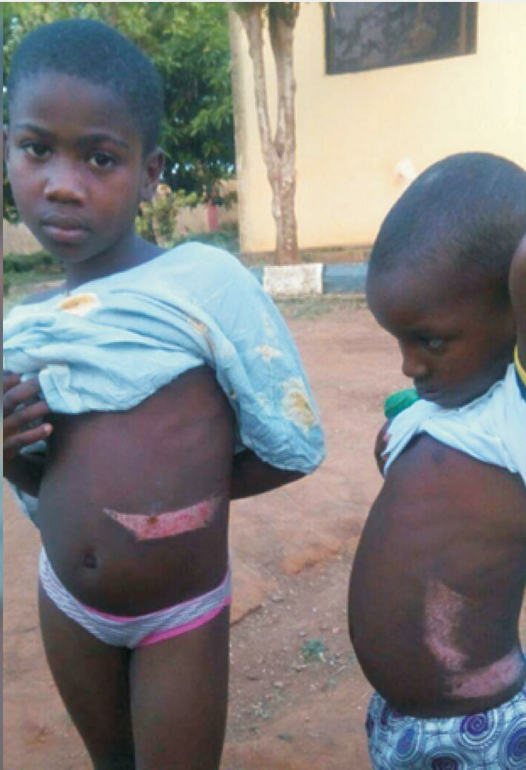 Alhaji Kasali Mumuni, 41, has been arrested for allegedly burning the stomachs of his two children, Maryam, 9, and Ojonla, 6, with hot knife in Owo, Ondo State... Instablog9ja reports. Kasali has been married thrice but report had it that none of his wives stayed with him for more than three years before they were sent packing with their children. Vanguardngr gathered that Kasali left home that fateful day for work, only to return to discover that the only fish in the pot had been eaten. It was learnt that one of the children took half of the fish in the pot and, when their step- mother returned from where she sells herbs, she ate the remaining half. Meanwhile, when the father of the house came much later and his food was served without fish, hell was let loose. The step-mother, who allegedly was not comfortable with the continued stay of the two children in the house, was said to have heaped the blame on the kids. Narrating what she and her sibling went through, Maryam said it was actually true that Ojonla ate half of the piece of fish in the pot and that when their step-mother returned from her shop, she ate the other half. Maryam said that their father beat them mercilessly and later went into the kitchen to light the stove and put a knife on it. “When the knife was hot and turned red, he pressed it on our stomachs one after the other. We cried and begged but our father refused to remove the knife. Our neighbors, who heard our cries, rushed to the scene only to be told by our father that they should mind their businesses. He held us down for several minutes as the knife was pressed on our stomachs." Neighbors later informed officials of the Nigeria Security and Civil Defence Corps (NSCDC) who rushed to the scene and rescued them. Kasali has since been arrested and the mother of the two children, who relocated to Ila Orangun, Osun State, after her divorce from the suspect, is back in Akure to take care of them.